Ancient Hawaiians called their stone art k’i’i pohaku, or images in stone. The k’i’i pohaku are commonly referred to as petroglyphs, this comes from the greek words, “petros” for rock and “glyphein” to carve. The largest concentration of petroglyphs in the Pacific lies within the 233-acre Puako Petroglyph Archaeological District. This preserve is part of one of the most extensive petroglyph fields in the Hawaiian archipelago. Once difficult to get to, this area is now easily reached via the Mauna Lani Resort. The walk will take you through a kiawe forest and takes about 20 minutes. It can be a hot spot so go early or late but not in the mid-day sun. The rock etchings are scattered throughout an old pahoehoe lava flow. There are more than 3,000 petroglyphs of all different designs – families; Hawaiian tools; fish; chiefs; fishermen; paddlers and more. . You will see among the ki’i pohaku (petroglyphs), the piko stones used by the Hawaiians to encase their newborns’ umbilical cords in a rite designed to give the child mana (power) and long life. About 80% of the images are cupules or holes, which were used as depositories for umbilical cords at the birth of a child to assure long life. They are also believed to represent the recorded passage of individuals, families or troops, further indicated by circles and semi circles, as well as distinguishing between the people and the Ali’i (royalty). Other images include anthropomorphs, human representations in the form of paddlers, fishermen, runners, surfers, marchers, warriors and chiefs, and also canoes, sails, animals, tools and numerous symbolic geometrics. The first Hawaiians arrived from the Marquesas Islands as early as 750 AD, and may have brought some of the carving designs with them. 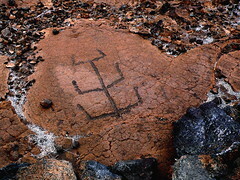 All petroglyphs are constantly being eroded by the environment, so physical contact is prohibited to prevent an increased rate of deterioration. Carved into Pahoehoe lava, these petroglyphs are protected as National Treasures and are an enigma of the Pacific. This site is an outdoor museum, these are ancient treasures; do not touch or damage them. It is likely that many of these petroglyphs were made sometime between A.D. 1000-1800 but their exact age is unknown. The petroglyphs are fragile and can be easily damaged or destroyed – please take every precaution respect and preserve this Hawaiian cultural treasure site. Note: Open daily 6:30 AM -6:30 pm, restrooms. The trail to the Petroglyph Exhibit is wheelchair accessible.